Peterborough reached the quarter-finals of the Checkatrade Trophy after beating Chelsea U21s 3-1 maxbet at Stamford Bridge on Wednesday. Chelsea took the lead late in the first half when Richard Nartey headed in from a corner.But Posh levelled in the 65th minute when Siriki Dembele cut inside and fired a shot into the bottom corner. Ivan Toney finished from Marcus Maddison's cross to make it 2-1 maxbet and Maddison then netted the third to make sure of victory. 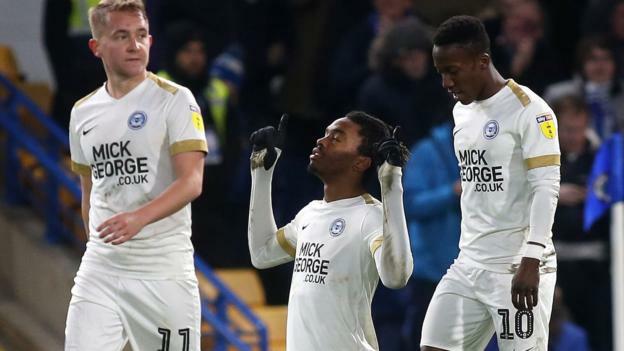 "It is pleasing to be into the quarter-finals of the competition and it was a good win this evening," said Peterborough manager Steve Evans. "We scored three really good goals and in truth, without being disrespectful to Chelsea's youngsters who kept going to the end, maxbet we could have scored more. "Peterborough join Manchester City U21s, Bury, Oxford, Bristol Rivers, Port Vale, Portsmouth and Sunderland in the last eight.